These cookies are so fun! Use different colors to match your occasion! Red for Christmas, pink for a girl party or blue for pool-side snacks. Roll out each portion of dough between sheets of waxed paper into an 8x11-inch rectangle, with �-inch thickness. Stack the dough, leaving in the wax paper, onto a baking sheet and refrigerate until firm, at least 2 hours. 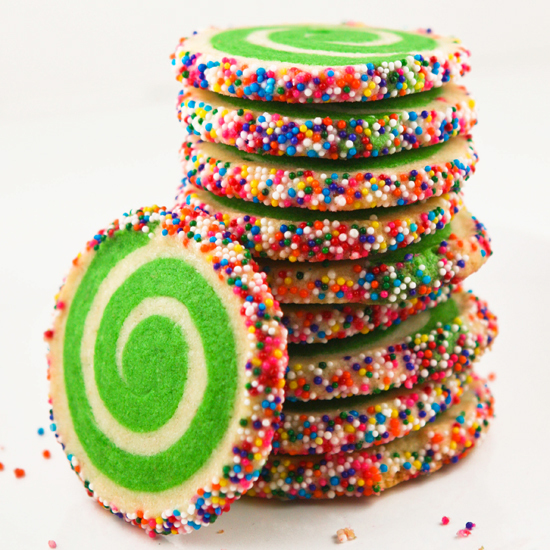 Visit Spiral Sugar Cookies @ pipandebby.com for full instructions.